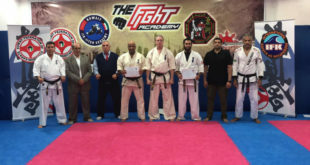 The Kuwait Federation of Kyokushin Karate congratulates Sensei Abdullah Al-Khurafi 3rd Dan on being promoted to Sandan we wish him more success in the futher. Also we would like to congratulates Senpai Slawmir Pudlocki on being promoted to Shodan. We in the KFK are looking forward for more development in the future for all.